It was most interesting to find this story and video about a school garden with sub-irrigated raised beds (widely known as SIPs) in Dallas. It was great to see that the beds are sub-irrigated and that they're named as such. These beds are sub-irrigated thanks to the work of U.S. Army Veteran Edgar Hercila. He anticipates the system will save about 90-percent of the water used in traditional growing. Other than the beds having reservoirs and fill pipes, there are no other details about the SIP bed construction. I'm wondering if Edgar has any business ideas about this. There certainly is an opportunity to make a living using modern methods of urban food growing. It is a wide-open field with great potential. Thanks to a lack of institutional education about sub-irrigation, there are an uncountable number of top-watered raised beds wasting tons of water across the country. There is an obvious need for practitioners, but the greatest need is for qualified educators. It isn't enough to know how to make utility buckets into sub-irrigated planters (SIPs). It's really quite simple. Qualified educators also need to be well grounded in plant science and the academic fundamentals of horticulture. It isn't enough to have only anecdotal gardening or farm work experience. DALLAS (CBSDFW.COM) – Moss Haven Elementary School in Dallas is celebrating its history by unveiling a series of sub-irrigation systems that will form a new educational program about agriculture and the environment. The school campus sits on land that used to be the Moss Ranch Farm. Friday the Moss Haven administrators, teachers, students and staff showed off 17 agriculture plots that will be ‘assigned’ to each classroom. The program called Bring Back the Farm was funded with a grant. Following is a design for a wheelchair accessible enabled raised bed as a conversation starter. If you have suggestions for improvement, jump in with a comment. Everyone benefits from creative group synergy. The diagram is from a PDF by Aimee McAdams, 18th Avenue Community Garden, Minneapolis, MN. It is linked on GardeningMatters.org. A site search reveals that they evidently haven't yet discovered the benefits of sub-irrigated planters (SIPs). You can combine the information in this diagram with the splendid photos of Johanne Daoust's rooftop garden in Toronto. She converted six top-watered raised beds to sub-irrigated planters (SIPs) last summer with very positive results. Simply follow her informative photos and the planter below will become a SIP in no time with very little extra work. Also look at this photo set that includes photos of what were likely the first sub-irrigated traditional raised bed planters in the U.S., maybe the world (photo left). Unfortunately the planters were destroyed when the garden center where it was located went out of business. At least we have the photo memories. The planters were a beta test and a resounding success from day one. You can see the robust health of the plants in the photo set. The water oxygen reservoirs were made from corrugated perforated plastic ag or drainage pipe but the SIP design works just as well with reservoirs made from recycled plastics such as nursery flats, milk containers, juice bottles and other plastic food containers. Update: As of 9:05 am ET January 29 there are 3,967 questions about marijuana and only 1 about what I posted about. There are obviously a lot of people who are well organized (and funded) around pot growing but don't get it about urban food growing. Is marijuana our national priority over new job creation, hunger, better nutrition, obesity and childhood lead poisoning? If it is, we have bigger problems in this country than I realized. Many of you may know that the White House sent an email invitation to post a question to the president on YouTube. I did! This is a screenshot (no live links) of my question to President Obama in 250 characters and spaces or less. Both the "watch video link" and the bit.ly link go to the logo video on TEDxManhattan. To find the question scroll down to the Search box on the right and search on the word SIPs or sub-irrigated. Please do yourself and all the children you know a favor by giving it a thumbs up, Tweet it and do whatever else you can do in the great big wide world of social networking to share the question with others. I truly regret not having my social networkng act together yet, but I will very soon! The Dear Mr President question is only the start of things to come. A new activist web site to get modern methods into the so-called Peoples Gardens including the White House Lawn garden is in the very near future. With no demonstration of a dirt garden alternative like SIP beds and boxes they should be called the Some of the Peoples Gardens. Thanks to the UN FAO organization, The Growing Connection, there are a few EarthBoxes in the USDA Peoples Garden in D.C. Other than this rather anemic demonstration that few Americans know about the rest of the gardens are all about top-watered dirt boxes. These inaccurately named Peoples Gardens are certainly not gardens for all the people who live in concrete jungle cities, particularly inner city neighborhoods of color. Here are some very smart people who get it and deserve your recognition. Rick Bayless, chef extrordinaire and a favorite of Barack and Michelle Obama grows vegetables on the roof of Frontera Grill in EarthBox SIPs. Smart chef! Smart Chicagoan! Vikram Bhatt, Director of the McGill School of Architecture’s Minimum Cost Housing Group (MCHG) initiated the McGill Edible Campus. This award winning campus garden was created by students who made the SIP planters from recycled materials. The campus is a joy to behold. Smart educator, smart students! Smart Canadians! Ron Wolford, Madiem Kawa, of the U of IL Extention Program and Cook County Master Gardners are the ones who create, manage and maintain the innovative gardens, including EarthBox SIPs on the grounds of the Museum of Science and Industry & Smart Home. Smart educators! Smart Chicagoans! Johanne Daoust in Toronto discovered SIPs last year, converted her entire rooftop garden (including traditional raised beds) and heard the applause of all of her friends. Smart professor! Smart Canadian! Read a prior post here. Long time penpal Heidi Hough who created the SIP acronym, has been growing in SIP buckets for years. Smart editor! Smart Chicagoan! Helen Cameron, co-owner of Uncommon Ground restaurants in Chicago grows some of her rooftop vegetables in EarthBox SIPs and also created a sidewalk garden with them. Smart business woman! Smart Chicagoan! Lorraine Gibbons of Garden State Urban Farms founded a socially responsible business serving the needs of New Jersey urbanites of all stripes, including Newark Mayor Cory Booker. She grows in many EarthBox SIPs as well as a hydroponic greenhouse. Smart business woman! Smart New Jersian! Smart Mayor! Larry Hall invented a very creative way to use SIPs and rain gutters to make an auto-irrigated gardening system. This SIP system has enormous potential for urban food production, school and community gardens in particular. Larry has done this for social good. Smart inventor! Smart Minnesotan! There are many, many more smart SIP gardeners across the country and around the world. We just haven't organized yet, but we will! Johanne Daoust in Toronto has been most helpful in posting a series of photos with notes that show how she converted her rooftop garden planters into sub-irrigated planters (SIPs - known erroneously as "self-watering"). Her planters include a variety of round planters as well as traditional wooden raised beds one of which is shown here. 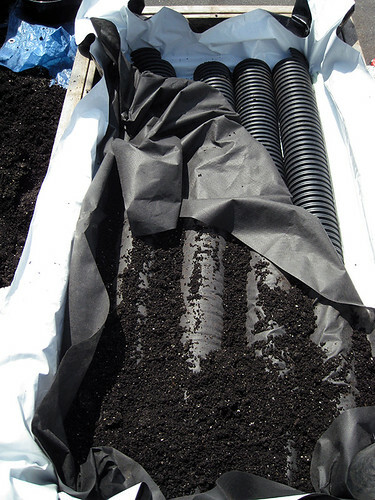 The raised bed is shallow (for growing lettuce and greens) so she made the water and oxygen reservoirs from 4" diameter perforated corrugated drain pipe cut in half lengthwise reducing the height to just 2". She used sheet plastic to make the bed watertight (it is black on one side and white on the other). The photo below shows the all important overflow drain hole tube (lower left). This is the feature that is critical to keeping the system in balance and preventing overwatering. She covered the reservoir pipes with landscape fabric. 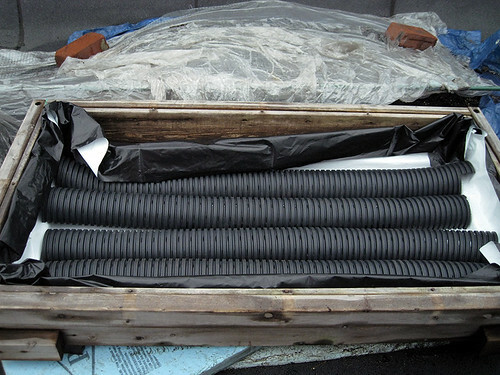 This prevents soil from falling through either the perforations or the open ends of the pipe. This is a good idea and one that I will use in the future. Note that she folded back the landscape fabric in the photo (upper right) so that you can see the construction. 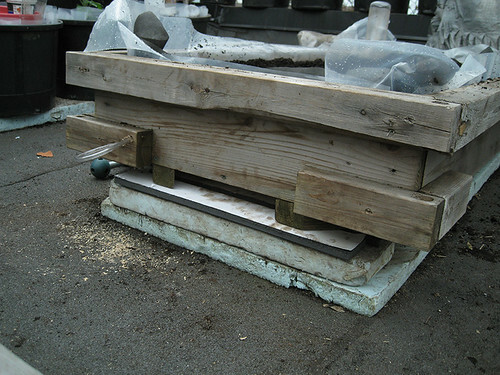 Here you can also see planter mix added to create the soil wicks (spaces between the pipes). The next step is to fill the planter to the rim with planter mix before sowing seeds or setting starter plants. See her Flickr photo set for views of how she converted other planters including ceramic with a drain hole into SIPs using methods very similar to what you see in the planter bed photos. This is one of the better rooftop garden designs that I have seen in my travels around the web. The one missing ingredient however is sub-irrigation. There are raised bed planters of various designs all over the world but very few of them are sub-irrigated. Because of urban soil contamination and other reasons, they may be the most popular form of urban gardening other than traditional in-ground growing. Regrettably, there is very little information about how to construct them along with the news about the major benefits they offer. 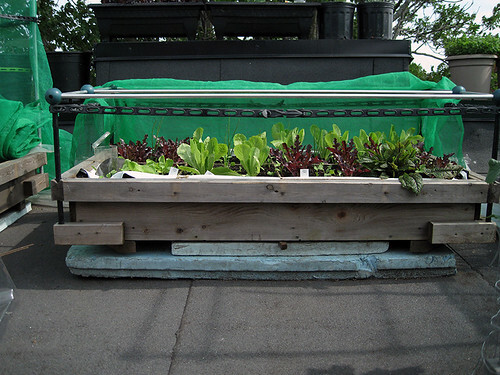 Sub-irrigated planters including raised beds will produce more food per square foot than even drip irrigated plantings. At the same time, they save up to 90% of the water. Further, there is no runoff into the surrounding environment. One source of information about sub-irrigated beds is Australia. A search on the term “wicking beds” will lead to some valuable information about people growing food under difficult climatic conditions. Although it may seem so due to buzz about the EarthBox and DIY versions, sub-irrigated agriculture is certainly not new. Search Google Books and you will find information about sub-irrigation from more than 100 years ago. The current lack of consumer information is a sad commentary on our horticultural education system. Our horticultural and botanic institutions ignore their obligation to the public to present options rather than dictate only one method. There are many modern options of producing food other than growing in often-contaminated urban soil.